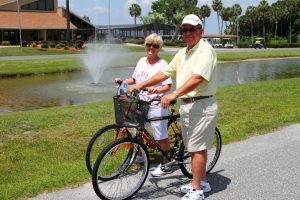 If you’re looking for an active adult community of like-minded neighbors that is nestled in a serene lakeside setting, offers easy access to aquatic activities, and is also close to world-renowned attractions, then Lake Griffin Harbor is the perfect choice. We are situated in scenic Leesburg, Florida, in the heart of the beautiful Chain of Lakes region, known for its rolling hills, glistening lakes, and tranquil beauty. It’s the ideal environment for you to live and enjoy resort-style Florida living, but with extraordinary affordability. Our 55-slip marina is a perfect spot for storing your recreational watercraft, so it’s always readily accessible when you decide it’s time for some aquatic fun. And be sure to bring your fishing gear, because the bass fishing on Lake Griffin is legendary. In fact, Lake Griffin is home to trophy bass fishing tournaments, and prize-winning fish are frequently caught by our residents. But that’s not all our active adult community has to offer. You can take advantage of the many recreational and social activities that fill the community’s calendar, or venture out to the Orlando area and enjoy the many attractions and venues that draw tourists from all over the world – and all of it within just a short drive from Leesburg. Contact one of our friendly Lifestyle Consultants today to learn more about the Lake Griffin Harbor active adult community, or to ask any questions you may have about Leesburg, FL, and the surrounding region. We’ll be happy to help you transition into your affordable Florida retirement lifestyle.